In the blog article How to design a flat plate heat sink the analysis of a vertical flat plate heat sink cooled via natural convection and radiation is explained. In this article we’ll explain the heat sink thermal resistance calculations necessary to estimate the thermal performance of a flat plate heat sinks in the two additional orientations as shown in figure 1. 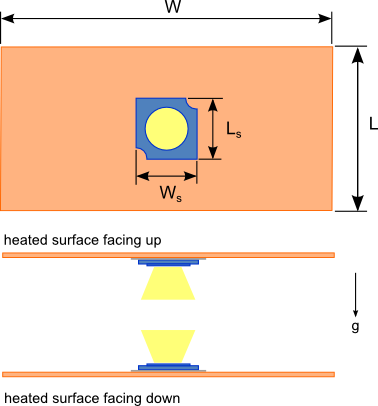 Analyses for a flat plate heat sink oriented at incremental angles between the vertical orientation, horizontal orientation with the heated surface facing up and the horizontal orientation with the heated surfacing down will not be provided since the thermal performance will lie some where between these three orientations. The horizontal orientation with hot surface facing down typically has the worst performance. The orientation of the flat plate heat sink has no effect on conduction from the LED heat source through the flat plate to the external surface and radiation from the external surface. Please refer to the blog article How to design a flat plate heat sink for a detailed explanation of the junction to case resistance, contact/thermal interface resistance and radiation resistance calculations for a flat plate heat sink. The equation for thermal convection resistance Rconv from the surface of a horizontal flat plate with the heated surface facing upward or downward is given by equation 6. The corresponding average Nusselt number, NuL for each orientation (equations 1 and 2),  are used to calculate the convection thermal resistance Rconv of each orientation. Using the procedure and equations described in the blog post How to design a flat plate heat sink and replacing the thermal convection resistance equation with equation 6 the performance of the flat plate LED heat sink can be estimated. 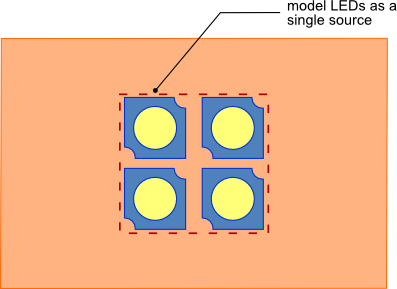 If multiple identical LEDs are being cooled by the heat sink and they are spaced very close to one another then a reasonable approximation is to assume that the LEDs are equivalent to one single large heat source as shown if figure 2. The heat source should have an area that is equivalent to the sum of the areas of the LEDs that are in contact with the heat sink. The equivalent interface (Rint-eqv) and junction to case thermal (Rth-jc-eqv) resistances for the single equivalent heat source need to be calculated as shown in equations 8 and 9.